lately i’ve been on a pizza binge. i’ve probably had pizza almost once a day for the past week and a half. and although, i really do enjoy a good slice, it got me thinking, what’s my favorite pizza in HoCo? Most recently, it’s probably the pizza from Coal Fire over off of Rt. 108 near Rt. 100. they have a great selection of pizzas as well options to make your own. you can choose from different sauce and different toppings. we enjoy the sweeter sauce with the ground beef on top. they also have a warm char-grilled warm caesar salad that is tasty too! it seems like there are a never ending supply of options in howard county though for pizza. there are the standard carry out and delivery places like papa john’s, domino’s, and jerry’s subs and pizza. for a quick pizza, my wife and really enjoy the trattoria e pizzeria da enrico in the king’s contrivance village center. they make a great pizza and is nicely priced. we usually get half sausage and mushroom. that is usually the same we order at three brothers as well, although, we also enjoy the square, thick crust pizza as well. the square pizza was a standard of her childhood. recently we also tried facci. another wood fire restaurant like coal fire but a little fancier inside and a wider menu variety. even though it’s on the east side of howard county and on the way to fulton/216, it’s worth the drive to it check out for those on the other side of the county. so my question to you is, what is your favorite pizza in HoCo? with almost at least one pizza shop in each village center and/or shopping center, there are lots of options! there is even pretty decent pizza at oriole park these days! Great question! You named my favorite pizza place here in HoCo. I love Coal Fire Pizza. I think their stuff is great and probably the best in the county. I did try Facci when they first opened, but wasn’t thrilled by the speed of the service, the long wait to get a seat, and the parking situation there. Normally I don’t judge a restaurant based on the service/quality of things when they first open, but I just haven’t had a chance to get back over there and I probably wont considering Coal Fire is so close to my home. One of the places I really enjoy the pizza at is the Stained Glass Pub in Elkridge. It’s similar to Ledo’s in that it is done in a square baking sheet. They have half price pizza nights on Monday and Tuesday and that always makes for a great deal. I think the pizza there rocks! But I have to venture outside of HoCo to get my favorite pizza. There are two locations that I think are the bomb when it comes to pizza. If you want brick oven fired pizza, Brick Oven Pizza in Fells Point (Baltimore) is amazing. If you like deep dish, I love rockin the all you can eat lunch at Armand’s in Silver Spring. If you haven’t tried either of those, give them a whirl and let me know what you think. I will have to check those places out as well as Stained Glass Pub. Don’t usually make it to that part of town regularly. Thanks for the suggestions! We got good service and sat right down at Facci, but I agree, parking is a complete pain. Worth a second chance. Hands down, 100%, Trattoria Pizzeria (either in Dorsey Search or King’s Contrivance). But I also like the takeout at Roma’s in Phelps Luck, and the pizza at Pazani in Elkridge. We like both too. My wife used to live off Columbia Rd and we went to that one regularly as well. Haven’t had the pizza at Roma’s, just the cheese steaks. Where is Pazani? Will have to try it. Upper Crust right of 100 by the old movie theatre is good as well. 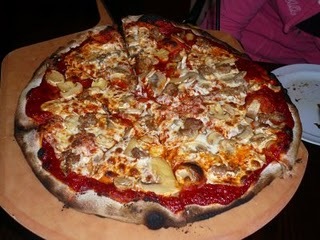 I usually make my own – http://p90noir.blogspot.com/2011/05/second-best-pizza-in-town.html. That said, I prefer Facci. My four year-old daughter is crazy for Trattoria in the KC Village Center – she can easily put away two slices which is impressive for a kid that weighs less than 40 lbs. and rarely eats more than a few bites in a single sitting. We make our own every now and then too but nothing like the one on your blog! Looks great! Guess one day I’ll have to get a gas oven.